Langley Air Force Base (IATA: LFI, ICAO: KLFI, FAA LID: LFI) is a United States Air Force base located adjacent to Hampton and Newport News, Virginia. It was one of thirty-two Air Service training camps established after the entry of the United States into World War I in April 1917. On 1 October 2010, Langley Air Force Base was joined with Fort Eustis to become Joint Base Langley–Eustis. The base was established in accordance with congressional legislation implementing the recommendations of the 2005 Base Realignment and Closure Commission. The legislation ordered the consolidation of the two facilities which were nearby, but separate military installations, into a single joint base, one of 12 formed in the United States as a result of the law. "AirPower over Hampton Roads" is a recurring airshow held at Langley in the spring. Many demonstrations take place, including the F-22 Raptor Demonstration, Aerobatics, and parachute demos. Because of the possibility of crashes of the F-22s and other aircraft stationed at the base, the City of Hampton has partnered with the Commonwealth of Virginia and United States Air Force to purchase privately owned property within the Clear Zone and Accident Potential Zones, without using eminent domain, to create a safety buffer zone around the base. Langley Field was named after Samuel Pierpont Langley, an aerodynamic pioneer and a former Secretary of the Smithsonian Institution. Langley began aerodynamic experiments in 1887 and formed a basis for practical pioneer aviation. He built and saw the first steam model airplane in 1896 and the first gasoline model in 1903. Both planes were believed to be capable of flight. He also built the first man-carrying gasoline airplane in 1903, which failed to fly on its first attempt and broke apart and crashed on its second. It was, after major modification eleven years later, flown "successfully" by Glenn Curtiss for a little over 3 seconds, traveling 150 feet through the air in 1914. Langley Field was the first Air Service base built especially for air power, is the oldest continually active air force base in the world, and is the oldest airfield in Virginia. In 1916, the National Advisory Council for Aeronautics (NACA), predecessor to NASA, established the need for a joint airfield and proving ground for Army, Navy and NACA aircraft. NACA determined that the site must be near water for over-water flying, be flat and relatively clear for expansion and the landing and take-off of aircraft, and near an Army post. The Army appointed a board of officers who searched for a location. The officers sometimes posed as hunters and fishermen to avoid potential land speculation which would arise if the government's interest in purchasing land was revealed. Fifteen locations were scouted before a site near Hampton in Elizabeth City County was selected. In 1917, the new proving ground was designated Langley Field for one of America's early air pioneers, Samuel Pierpont Langley. Langley had first made tests with his manned heavier-than-air craft, launched from a houseboat catapult, in 1903. His first attempts failed and he died in 1906, shortly before a rebuilt version of his craft soared into the sky. Several buildings had been constructed on the field by late 1918. Aircraft on the ramp at that time included the Curtiss JN-4 "Jenny", used by Langley's School of Aerial Photography, and the de Havilland DH.4 bomber, both used during World War I. Although short-lived, hydrogen-filled dirigibles played an important role in Langley's early history and a portion of the base is still referred to as the LTA (lighter-than-air) area. 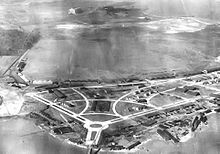 In the early 1920s, Langley became the site where a new air power concept was tried and proven. Brig. Gen. Billy Mitchell led bombing runs from Langley by the 1st Provisional Air Brigade over captured German warships anchored off the coast of Virginia and North Carolina. These first successful tests set the precedent for the airplane's new role of strategic bombardment. 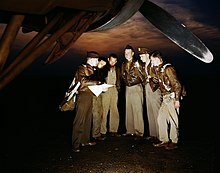 Throughout the 1930s Langley Field occupied a principal position in the Army's efforts to strengthen the offensive and defensive posture of its air arm. The small grassy field became a major airfield of the United States Army Air Corps, and many of the brick buildings of today were constructed at that time. At the outbreak of World War II Langley took on a new mission, to develop special detector equipment used in antisubmarine warfare. Langley units played a vital role in the sinking of enemy submarines off the United States coast during the war. The field was also used for training purposes. On 25 May 1946 the headquarters of the newly formed Tactical Air Command were established at Langley. The command's mission was to organize, train, equip and maintain combat-ready forces capable of rapid deployment to meet the challenges of peacetime air sovereignty and wartime air defense. The arrival of Tactical Air Command and jet aircraft marked the beginning of a new era in the history of the field, and in January 1948 Langley Field officially became Langley Air Force Base. In January 1976 the 1st Tactical Fighter Wing was transferred to Langley from MacDill Air Force Base, Florida with the mission of maintaining combat capability for rapid global deployment to conduct air superiority operations. To accomplish this mission, the 1st TFW was the first USAF operational wing to be equipped with the F-15 Eagle. On 1 June 1992, Langley became the headquarters of the newly formed Air Combat Command, as Tactical Air Command was inactivated as part of the Air Force's restructuring. On 15 December 2005, the 1st Fighter Wing's 27th Fighter Squadron became the Air Force's first operational F-22 fighter squadron. The wing's complement of 40 F-22s, in the 27th and 94th FS reached Full Operational Capability on 12 December 2007. Langley Air Force Base was severely damaged by flooding due to the storm surge from Hurricane Isabel in September 2003 and again during the November 2009 Mid-Atlantic nor'easter. Hurricane Isabel damages to Langley Air Force Base were approximately $147 million. The damages associated with the 2009 nor'easter were approximately $43 million. The 1st Fighter Wing is composed of the 1st Operations Group and the 1st Maintenance Group, which work together to maintain Joint Base Langley–Eustis's F-22 Raptors. The 480th ISR Wing operates and maintains the Air Force Distributed Common Ground System, or DCGS, also known as the "Sentinel" weapon system, conducting imagery, cryptologic, and measurement and signatures intelligence activities. 497th ISR Group, Joint Base Langley–Eustis, Va. The 192d Fighter Wing mission is to fly and maintain the F-22 Raptor at Joint Base Langley–Eustis through the 149th Fighter Squadron, and support the ongoing intelligence mission through the 192d Intelligence Squadron. The 633rd ABW is an Air Force-led mission support wing, serving both Air Force and Army units, as a result of a congressionally mandated joint-basing initiative between Langley and Eustis. Langley also hosts the Air Force Command and Control Integration Center field operating agency and Headquarters Air Combat Command (ACC). Langley is also home to the F-22 Raptor Demo Team. This team, who travel all over the world performing different maneuvers used in air combat, is used to help recruit for the United States Air Force. Performing at airshows and other special events, the squadron is the only demonstration team to use the F-22 Raptor. ^ "Hampton continues request for Langley buffer zone funding". tribunedigital-dailypress. ^ "Joint Base Langley-Eustis - Units". af.mil. Archived from the original on 2011-07-12. Wikimedia Commons has media related to Langley Air Force Base. Langley AFB Installation Overview from AirForceUSA.org.